Spanish edition of the Wisconsin 4th-Grade Wisconsin History Textbook "Wisconsin: Our State, Our Story." 256 pages, 10" x 9"
Now available is the Spanish edition of the Wisconsin Historical Society Press' award-winning 4th-grade textbook, "Wisconsin: Our State, Our Story." In partnership with Milwaukee Public Schools, the Press has translated the definitive state textbook into the Spanish edition: "Wisconsin: Nuestro Estado, Nuestra Historia." All components of the textbook have been translated into Spanish including text, illustrations, maps, timelines and image captions. "The translation of 'Wisconsin: Nuestro Estado, Nuestra Historia' provides equal access to Hispanic students as an integral part of our curriculum, through a well-explained and beautifully written account of our history as a state and its impact in the nation's history," said Christina Green, language specialist for the Milwaukee Public Schools. "This new book will also be enjoyable for parents and siblings alike." 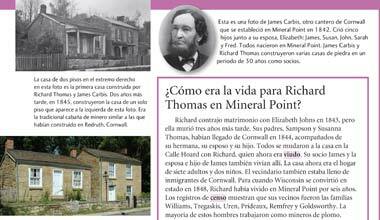 View a sample page from Chapter 6 of the Spanish edition of "Wisconsin: Nuestro Estado, Nuestra Historia." 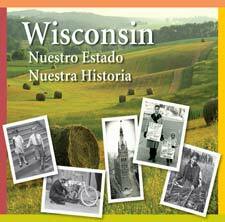 "Wisconsin: Nuestro Estado, Nuestra Historia" teaches Wisconsin history through an inquiry-based approach with lively stories from famous and everyday Wisconsinites who shaped our past as well as timelines and pronunciation glossaries. The textbook incorporates a wealth of Society resources including illustrations, photographs and maps. The textbook encourages student participation with "Thinking Like a Historian" questions, literacy, vocabulary, strategies and other visual materials. Dubbed the "first truly comprehensive textbook devoted to Wisconsin history for elementary students" by Tina Flood, executive director of curriculum and instruction for Milwaukee Public Schools, the state history textbook is designed to promote strong literacy and content skills — now in Spanish as well as English.